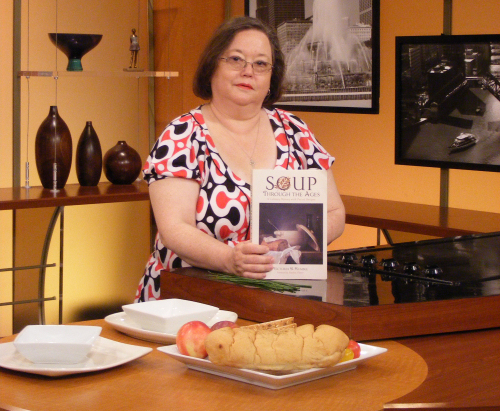 Victoria had the opportunity to demonstrate historic foodways on national television, WGN Chicago. I currently have three titles still in print and others in the works. 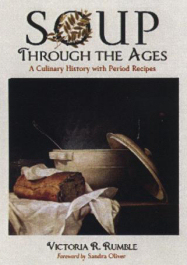 The first two are available directly from me, and my book (Soup Through the Ages: A Culinary History with Period Recipes) is available from McFarland Publishing (details below). I’m offering the first two books at half-price for blog readers – just mention thehistoricfoodie and claim your discount. (Normally $30. – for blog readers $15. plus S&H $4.) Wholesale prices are available at significant savings as well. Email me at thistledewbooks [at] yahoo [dot] com for the address and any other information you may need. This book is a general overview of foods, cooking techniques, cookware, preserving, fruits and vegetables, etc. through the 19th century. It has been sold in prestigious book shops and museum shops throughout the country, Canada, and Scotland. In recent years it has been as popular among those who want to live a more self-reliant lifestyle as it is among historians. Regular price $30. – mention the blog and receive a 50% discount – your cost $15. + $3.50 S&H. Email for address – thistledewbooks [at] yahoo [dot] com. Outdoor Recreation & Leisure begins in the pre-antebellum period and traces the most common as well as some obscure outdoor activities with special emphasis on the participation of women, children, and families. Even hard working planter classes made time for vacations and outdoor activities – the historian will find loads of ideas for interpretation while those seeking a more self-reliant lifestyle will find a great deal of information on shelters, fishing, hunting, cooking outdoors, etc. Normally $30. – mention the blog and receive a 50% discount – you pay $15. + S&H $4.00. Inquiries about wholesale orders are welcome – thistledewbooks [at] yahoo [dot] com. This book was called, “A massive amount of research…a solid contribution to culinary history,” by Andrew Smith, food historian and author. Elizabeth Williams, president of the Southern Food and Beverage Museum in New Orleans said of it, “belongs on the bookshelves of all historians. The development of soup is the development of civilization”. The book begins in the Biblical era and takes the reader through the second World War – with all the history of each period including a lengthy and well documented chapter on soups consumed by Native Americans. You will not find modern recipes masquerading as historic or Native American receipts in this book – it is factual and thorough, and the information came directly from primary sources. The reader will learn about cook fires and other important and related topics. This book is available from McFarland Publishing Co. They will welcome your order, wholesale or retail. This book was written by the author as her own quick but thorough source of information in order to thrive while being self-sufficient and ready for any situation. Because it was written to be her own “go-to” reference book, it covers a complete array of topics helpful to anyone who wants to share a self-sufficient lifestyle. The book will be an extremely valuable resource for the historian or living history village because the information is taken from primary sources and the articles are fully documented. Do you want to know what kinds of plants can be cooked for a nutritious pot of greens or what fruits or plants can be used to make syrup in the event it can’t be snatched off the grocery store shelf? How about how to make a meal or dessert and sauce from pantry staples and/or wild ingredients? If it has to do with foods or food preservation, harvesting from Nature, finding good water, building a proper fire to cook food, or a plethora of other related topics, it will be found in this book. Again, it was compiled by the author so that she has the information in one source that can be used at home or tossed into a backpack. Depending on the situation, one may want to know how to substitute items from Nature’s grocery store over the long haul, and this book is that source. SELF-SUFFICIENCY AS GRANDMA KNEW IT© is almost completed and ready to share. Contact the author for information and availability. The author’s intent is to share useful information for those of like mind. Victoria has spent the last four years researching salads – as in the big picture of all ingredients combined to form a salad from the Middle Ages to present. This includes both wild and cultivated vegetables and herbs, and both fresh and cooked dishes such as a pot of greens (cultivated or wild) or roasted vegetables dressed with olive oil and vinegar. The tentative title is “The History and Evolution of Salads in America”. It is encyclopedic in format for fast reference. The reader will learn how popular and important these salads were through the centuries, the history of the many vegetables and herbs used in them, and so much more. The book is factual regarding various wild plants eaten by Native Americans and discusses whether they were eaten raw, cooked, or both. Again, you won’t find modern recipes passed off as Native American foods. If trying times befall us, the reader will appreciate knowing how to harvest wild foods and make them into nutritious meals. Any living history site or individual interested in historical interpretation will know what the vegetables and fruits from a particular area looked like so they can duplicate them as best they can for their presentations. They will also be confident that ingredients they want to use for their interpretive programs were available for the time period and place. Contact the author for information and availability. The first genealogy book published by Victoria was “Guardian Angels: A History of the Killen and Related Families“. She continues to get requests for it long after available copies were sold and used copies sometimes fetch handsome prices in antique stores. Families include Springer; Thornton; Gresham; Mitchell; McDougal; Phillips; Wright; Stutts; and many others as well as a great deal of information on the early settling of Lauderdale County and North Alabama. Victoria is currently editing this book and the information being added will double the size of the first edition. She has also added additional photographs and welcomes submissions. Her plans are to offer this treasure in CD-ROM form in order to keep it at an affordable price. With the additional information that has been added printing costs would be prohibitive for some readers. Those who purchase it, can print it and bind it themselves if they so desire. thistledewbooks [at] yahoo [dot] com for updates. “The Brady Bunch & It’s Many Family Connections” is almost ready for release. 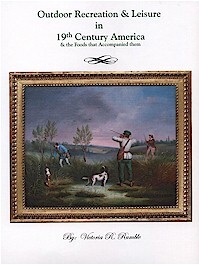 This book traces the Brady family and its numerous connected family names (Brady, Hershey, Shannabrook, Swartzbaugh, Weisensale, Zartman, Hess, Albright, Staub, Buck, Strausbaugh, Bewerts, Driscol, Riehm, March, Klein/Little, Teal, Becker, Klinepeter, Kohl, Kramer, Mattheis, Hoenegger, etc.) of Pennsylvania-Dutch country. Some of these families are traced from decades or centuries prior to their immigration from the Palatinate, Alsace, Switzerland, etc. to the colony of Pennsylvania to present. This book was written primarily for the Brady family from McSherrystown, PA, but will be available to anyone who is interested in or descends from these many families. Victoria was honored to receive an invitation to join the Lancaster Mennonite Historical Society while researching the area history,the culture, and the families documented in the book. 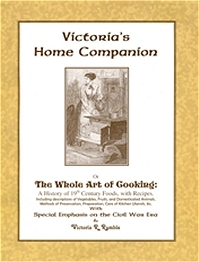 Victoria can be reached at thistledewbooks [at] yahoo [dot] com or 256-349-4310. Enquiries and discussion are welcome. Thank you kindly, Paul, coming from someone as knowledgable as you I take that as high praise. I hope you and Daisy had a great holiday season, and I’m looking forward to seeing you again in November. Thanks for sharing, you started out my day with a pleasant surprise!